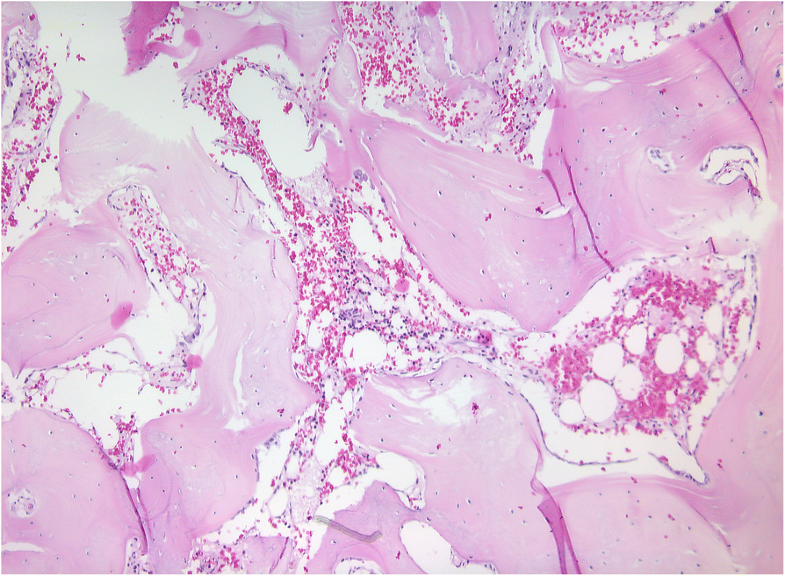 Myositis ossificans describes a heterotopic bone formation within a muscle. Thereby myositis ossificans is classified in two different groups: myositis ossificans progressiva (MOP) which describes a genetic autosomal dominant rare disease and myositis ossificans traumatica (MOT). The exact pathogenesis of MOT is unclear. The aim of this article was to analyse and interpret the existing literature reporting MOT of masticatory muscles and compare the results with our own clinical experience with MOT. Risk-factors, etiology, clinical features, diagnostic imaging, as well as different treatment options were evaluated and recommendations for the prevention, diagnosis, and therapy of MOT of the masticatory muscles were given. Following the PRISMA-Guidelines, a systematic search within the PubMed/Medline database with a view to record literature of MOT of the masticatory muscles was performed. Furthermore, the database of our own clinic was screened for cases of MOT. In total, 63 cases of MOT of the masticatory muscles which were reported in English-based literature were included in this study. Overall, 25 female and 37 male patients could be analysed whereas one patient’s gender was unknown. Complication of wisdom-tooth infection (n = 3) as well as the results of dental procedures like dental extraction (n = 7), mandibular nerve block (n = 4), periodontitis therapy (n = 1) were reported as MOT cases. From the 15 reported cases that appeared after dental treatment like extraction or local anesthesia the medial pterygoid (n = 10) was the most affected muscle. Hereof, females were more affected (n = 9) than males (n = 6). The most reported clinical symptom of MOT was trismus (n = 54), followed by swelling (n = 17) and pain (n = 13). One clinical case provided by the authors was detected. Dental procedures, such as local anesthesia or extractions, may cause MOT of the masticatory musculature. Demographical analyses demonstrate that females have a higher risk of developing MOT with respect to dental treatment. The most important treatment option is surgical excision. Subsequent physical therapy can have beneficial effects. Nevertheless, a benefit of interpositional materials and drugs as therapy of MOT of the masticatory muscles has not yet been proven. Myositis ossificans progressiva has to be excluded. Myositis ossificans describes a heterotopic bone formation within a muscle. Depending on its cause, the syndrome was classified into two different groups: myositis ossificans progressiva (MOP), also known as fibrodyplasia ossificans progressiva which describes a genetic autosomal dominant genetic disease, and myositis ossificans traumatica (MOT). According to its name MOP develops systemically in muscles, ligaments, fascia, and tendons . The prognosis for MOP is generally poor [2, 3]. However, MOT, which is also called myositis ossificans circumscripta, is characterized by ectopic bone formation within muscles and other soft tissues as a result of a preceded trauma . Recent literature also defines further types of myositis ossificans like post-infectous myositis ossificans  or idiopathic myositis ossificans . MOT is mostly reported in the orthopedic literature as a result of repeated trauma in muscles like quadriceps femoris. In masticatory muscles, however, MOT is a rare condition which was first reported by Ivy and Eby in 1924 affecting the masseter muscle . In this sense, trismus is the most frequent symptom in the masticatory muscles . The diagnosis MOT can be made if trauma, characteristic clinical and radiological signs, as well as histopathological confirmation are presented . Differential diagnosis must be performed to exclude malignancies like sarcomas, or chondrosarcomas, as well as other neoplasias like osteoma, haemangioma, osteochondroma, or nodular fascitis . Also the anchored disc phenomen and myofibrotic contracture of muscle should be considered . The exact mechanism of the pathogenesis of MOT is unclear. Nevertheless, traumatic, iatrogenic lessions caused by the dentist such as extractions, mandibular block, or periodontal therapy are suspected to be a triggering factor similary to infections like pericoronitis [2, 5, 10–21] . Therefore, the aim of this article was to analyse and interpret the existing literature reporting MOT of masticatory muscles and compare the results with the authors own clinical experience with MOT. The focused question to be answered in this review was: what etiological factors, clinical symptoms, diagnostic imaging and treatments options are reported in current literature to the prevention, diagnosis and therapy of MOT of the masticatory muscles? 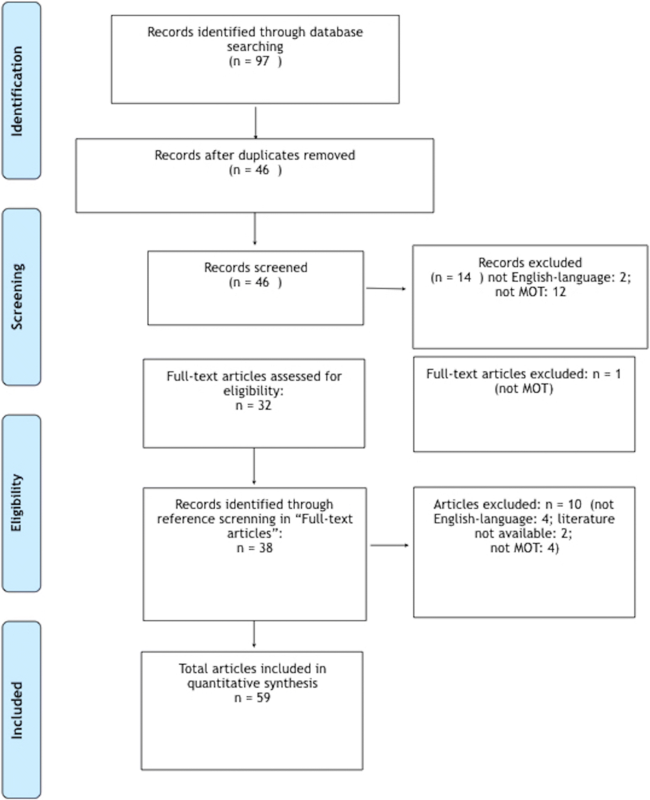 The literature search was conducted in accordance to the guidelines available at the “Preferred Reporting Items for Systematic Reviews and Meta-Analyses” (PRISMA) . The inclusion criteria consisted of studies describing clinical data reporting on myositis ossificans of the masticatory muscles since the year of the first report (1924) up to date. Due to the lack of clinical trials regarding this issue, no restriction was applied to the study design. Conversely, literature review, books or abstracts or those written in other language than english were excluded from this study. A search strategy was constructed based on PICOS (P = patients; I = Intervention; C = Comparison; O = Outcome, S = Study design), as described in Table 1. The search was conducted in PubMed/Medline database from July to October 2016. Additionally, a manual search was performed based on the references of the screened articles. The study selection was independently performed by two reviewers (MH and LH) and, in case of disagreement, a third reviewer (JK) was consulted. First, the articles were screened based on the review of titles and abstracts. Thus, the screened articles were selected for full-text reading and only those considered relevant for this review were included for analysis. The first reviewer (MH) extracted the relevant data from the eligible articles and organized them in tables, which were then crosschecked by the second reviewer (LH). The extracted data comprised information regarding gender and age of the affected patient, chief-compliant, affected muscle, history of trauma, treatment protocol, surgical intervention, and follow-up assessment. The qualitative assessment of the studies was performed using a critical appraisal checklist for case reports . The original check-list consisted of 8 items assessing the quality of case reports. For this study, one item of the original check-list was excluded (“Were adverse events or unanticipated events identified and described?”), as this was not applicable for the most part of the selected studies. All items were marked as yes, no, or unclear. Further, the percentage of positive response (yes) was calculated for each study (Additional file 1). The ethical approval for this study was obtained from the ethical review committee (Ref. no. 2017–052-f-N), Ethikkommission der Ärztekammer Westfalen-Lippe und der Westfälischen Wilhelms-Universität, Münster, Germany. A first literature search in PubMed database with the keywords indicated in Methods displayed 97 entries. After removing duplicates, 46 articles remained which underwent preselection by screening their abstracts. During the preselection round, two articles were excluded since they were not published in English language (Italian, Turkish) and further 12 articles were eliminated since they did not describe MOT. From these 12 excluded reports, 11 represented MOP cases and one reported about the Carey-Fineman-Ziter syndrome. Subsequently, 32 full-length articles were selected of which one was further excluded because of not detailing MOT. Screening of the references from these selected 31 articles led to further inclusion of 38 articles from which four were rejected again due to publication in national language (German: 2, Japanese: 1, Russian: 1), not describing MOT (n = 4), or unavailability (n = 2). The mode of literature search was summarized in Fig. 1. As a final result, it was possible to provide 59 articles reporting about 63 cases of MOT of the masticatory muscles in this study. The study characteristics of the included articles are described in Table 2. First surgery: excision, coronoidectomy- > recurence. Second surgery- > recurrence. Third surgery: excision + abdominal fat graft- > recurrence. First: conservative treatment without succes for 2 months. Overall, 63 patients were reported involving 25 female and 37 male patients that were analysed. One patient’s gender was not indicated. Therefore, approximately two out of three patients were male. The age ranged from 10 to 73 years in the female group (mean: 38.6 years). In the male group the age ranged from 21 to 68 years (mean: 37.4 years). The most frequent affected muscle was the masseter muscle, which was hit 35 times (left side: 23-fold, right side: 11-fold, side unknown: 1-fold). The temporalis muscle was concerned 22 times (left side: 14-fold, right side: 8-fold) followed by the medial pterygoid muscle with 21 cases (left side: 12-fold, right side: 9-fold). The lateral pterygoid muscle was affected 12 times (left side: 8-fold, right side: 4). In18 cases more than a single muscle was hit by MOT. The most reported clinical symptoms of MOT were trismus (n = 54), followed by swelling (n = 17), and pain (n = 13). Facial paralysis was outlined in one case, while three cases were reported to be devoid of any clinical symptoms. Trismus ranged from 0 to 15 mm (mean: 7.3 mm). As triggering event, strokes or falls were reported most frequently (n = 21), while in 12 cases a triggering event was unknown. Car accidents seemed to be the reason for five cases of MOT but MOT development due to dental procedures like dental extraction (n = 7), mandibular nerve block (n = 4), periodontitis therapy (n = 1), or as a result of alcohol injection into the alveolar nerve (n = 2) were also described. MOT as a complication of wisdom-tooth infection was reported in three cases. Furthermore, occurrence of MOT was published as a consequence of post-fracture (n = 3), gunshot injury (n = 2), perforating wound (n = 1), injury caused by a shell (n = 1), and after intubating a patient for 4 weeks (n = 1). Time intervals from trauma to treatment were not addressed in 13 cases, while in two reports no treatment was initiated. In 48 cases, time intervals were reported, which ranged from 3 weeks to 25 years, whith an average time of 31 months. The most frequent described treatment for MOT was surgical excision (n = 23) followed by surgery and physical therapy (n = 22). In addition to surgery, interposition grafts and physical therapy were performed by five authors, interponate with silastic and physical therapy was reported in one case, while another author described interponate with silastic, physical therapy, and drug administration using diodronel. Didronel was administered in addition to surgery according to one report. The use of dermalgraft in combination with surgical excision was also reported in one case. The use of radiation and surgery in combination with physical therapy and drug administration with indomethacine and etidronate was furthermore published in one case. Exclusive physical therapy was done in four cases, while treatment in two reports was not indicated. Multiple surgeries were necessary in 9 patients. Two patients were not treated at all. In 41 cases, no recurrence was reported after the first surgery. Nineteen out of these 41 cases were treated with a combination of surgery and physical therapy while 20 of 41 cases underwent exclusively surgery. One patient was treated with surgery in combination with physical and pharmacological therapy, while another patient was handled with surgery in combination with interponate and physical therapy. In contrast, recurrence took place in 11 cases whereas no treatment was performed or the outcome was not outlined in 11 cases. Recurrence was reported in a total of 11 cases. In 7 out of these cases multiple surgeries were performed which stopped any further recurrence. In four reports, unsuccessful treatment of MOT hampered recurrence analysis. To evaluate the clinical outcome “recurrence” in correlation with time of treatment, two groups were defined. In the first group, surgery was performed less than 6 months after trauma (n = 21). In this group five cases with recurrence were stated. In the second group, the interval from trauma to treatment was longer than 6 months (n = 27). In that herein also five cases with clinical recurrence occurred. In one case undergoing recurrence no interval from trauma to treatment was indicated. In a total of 13 reports, the interval from trauma to treatment was not noted and in two cases no treatment was initiated. Recurrence after the first treatment was found in 3 cases in which only surgery took place. Surgery in combination with physical therapy led to 3 cases of recurrence. Surgery in combination with fat pad and physical therapy led to recurrence in two reports, while recurrence also occurred to a patient who was treated with surgery in combination with diodronel. Recurrence was also reported during treatment with surgery in combination with radiation, indomethacine, diodronel, and physical therapy, as well as surgery with silastic interponate, diodronel, and physical therapy. In the group of successful treated patients, 20 authors reported about the development of MIO before and after therapy. MIO ranged from 15 to 49 mm in length with a mean of 29.6 mm. Only physical therapy (n = 1) yielded a 20 mm long MIO. 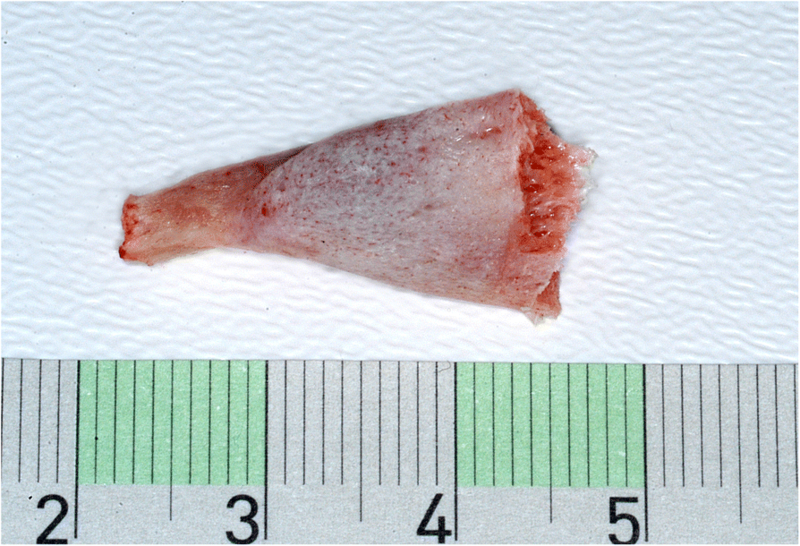 Surgery in combination with fat pad (n = 3) resulted in a MIO of 28.6 mm length (range: 23 mm–38 mm), while the MIO of patients with surgery in combination with physical therapy (n = 12) exhibited a MIO of 27.2 mm length (range: 15 mm–49 mm). Surgery alone (n = 4) yielded a MIO of 31.3 mm length (range: 30 mm–35 mm). In general, the risk of bias was considered low, since most part of the case reports were described in accordance to the check-list. Only 2 studies showed a percentage of positive response lower than 60% (Supplement 1). After searching the clinical documentation system of the University Hospital Münster only one self-generated entry for MOT could be recovered. A 28 year-old male was referred to our Clinic of Cranio-Maxillofacial Surgery with trismus in March 2016. The patient was not able to open or to close his mouth and, moreover, he was unable to protrude or to produce a lateral excursion. So he possessed an interincisal mouth opening of 5 mm. The patient indicated that he underwent a filling therapy on the right mandible molar by his dentist 7 months ago. As according therapy a right mandibular nerve block was performed. Four weeks later the patient developed trismus. His dentist described oral antibiosis and physical examination. However, no clinical improvement was observed. Therefore, the patient was referred to a Clinic of Cranio-Maxillofacial Surgery where the diagnosis of pericoronitis of the lower right third molar was stated. Extraction of the right upper and lower third molar and a forced mouth-opening was performed under general anesthesia. Subsequently, the trismus disappeared but reappeared 2 weeks later. Because of this relapse, coronoidectomy was performed on the right side. Consequently, the trismus disappeared, but a relapse reoccurred a few weeks later. A multislice computer tomography (CT) of the head was performed and the CT revealed a calcification of the right medial pterygoid muscle (Fig. 2). Due to the given diagnosis of MOT of the right medial pterygoid, the patient was finally referred to the Clinic of Cranio-Maxillofacial Surgery at the University of Münster. For excluding MOP, we referred the patient to the department of human genetics. Indeed, MOP could be excluded and also all laboratory test results ranged within normal limits, including the resulting values for calcium, phosphate, alkaline phosphatase and parathyroid hormone measurements. Thus, we decided to perform renewed surgery 6 months after the last surgical intervention. Pre-operative radiation was performed with 6 Gy as single-dose radiation. 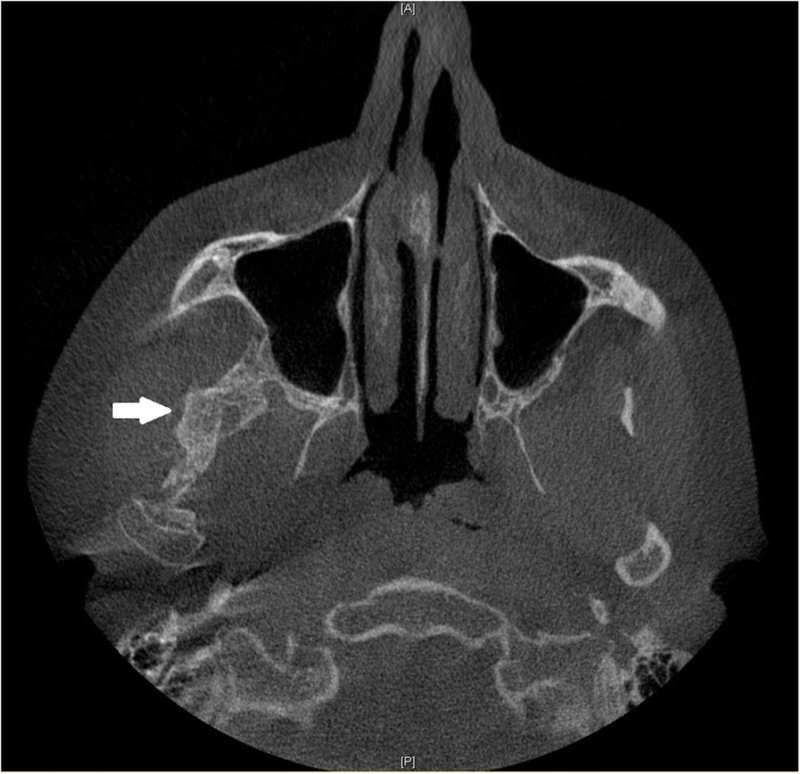 Surgical excision of the ossified right medial pterygoid muscle was performed through combined intra- and extraoral access under general anesthesia. During this intervention, solid bone mass could be excised (Fig. 3). Histopathological analysis confirmed the diagnosis of MOT (Fig. 4). Physical therapy was started 2 days after surgery and 1 week after surgical intervention the patient could be released. Post-operative long-term application of ibuprofen 400 mg was performed for 2 weeks. At this time point, the MIO reached 23 mm in length. The patient was instructed to perform intensive physical therapy with an functional orthodontic gadget, the so-called “Jeckel-spreader”, for exercising mouth opening. This device serves for mobilisation of the masticatory muscles. Two weeks later, the MIO still yielded 25 mm in length. Thereafter, the patient stopped physical therapy using the “Jeckel-spreader” against our recommendation. Consequently, the MIO decreased to 10 mm in length. Thus, we advised the patient strongly to restart physical therapy but he declined. Digital volume tomography (DVT) was performed which revealed renewed calcification (Fig. 5). Six months after surgery, MIO exhibited a length of about 8 mm. This enabled the patient to eat, to perform and to do a small lateral excursion. We have derived a decision tree for diagnosis and treatement of MOT (Fig. 6). The pathogenesis of MOT has not been finally clarified. In 1924, Carey  already listed four major theories for the development of MOT: 1) Displacement of bony fragments into soft tissue and hematoma with subsequent proliferation; 2) detachment of periosteal fragments into surrounding tissue with proliferation of osteoprogenitor cells; 3) migration of subperiostal osteoprogenitor cells into surrounding soft tissue through periosteal perforations induced by trauma; 4) differentiation of extraosseous cells exposed to bone morphogenic proteins. The results of the present study confirm the assumption,that multiple processes lead to the development of MOT. If a triggering event is present at all, its nature seems to be too heterogenous from case to case to support the theory of a single initiating cause. In 12 of the cases summarized here, no specific triggering traumatic event was identified (idiopathic myositis ossificans). Nevertheless, it seems that minor traumatic lesions unnoticed by these patients could be a possible cause. According to Torres  the intensity of the trauma may not be related to the occurrence of MOT. This statement could explain why no cases of MOT occurring in individuals that pursue the sport of boxing have been reported in the literature so far. These cases would be expected because of regularly occurring blows to the face and masticatory muscles (especially the masseter and temporal muscles) of boxers. On the other hand, a relation between dental surgery and the onset of MOT seems obvious. There are 7 case reports of MOT with previous tooth extraction [11–14, 20, 21, 25] though it is not possible to fully differentiate whether the extraction or the dental anesthesia in the context with the extraction represents the triggering event. The latter as a cause of MOT was reported in four cases [2, 15, 16, 19]. Mandibular block as reported by Trautmann  as well as in our reported case, could be a more possible triggering factor for MOT. Therefore local anesthesia cannot be excluded as a cause of MOT occurring after periodontal treatment, either . Furthermore, three cases of MOT following repetitive wisdom tooth infection have been published [5, 10, 18]. This would represent an additional indication requiring surgical removal of wisdom teeth if normal placement in the row of teeth is not expected. Trismus is the most frequently observed symptom of MOT in the masticatory muscles which was also presented in our case. In this respect, MOT should be considered in the differential diagnosis in case of persisting trismus without a clinically manifesting cause. In such cases, radiographic findings are being expected only 3–6 weeks after the appearance of clinical symptoms . So far, male patients have been considered as the main group at risk of developing MOT of the masticatory muscles with a male/female ratio of 2.4/1 . However, our data analysis demonstrated a gender-specific difference to a lesser extent with a male/female ratio of approximately 1.5/1. Since however MOT has been frequently related to traumas (e. g. fracture, blow) a possible explanation could be: males might have experienced traumas more often than females and thus also suffer more often from MOT. Of particular interest is the view at the cases of MOT occurring after dental treatment where more women (n = 9) were concerned than men (n = 6). This means prevalence for female patients of MOT of the masticatory musculature in context of dental treatment with a 1.5/1 ratio. In most cases of MOT of the masticatory muscles the masseter muscle is the most affected one . However, this is not true for those cases of MOT occurring after dental treatment. Of these cases (n = 10), 66% involved the medial pterygoid muscle. Given the potential risk of damaging this muscle in the context of a mandibular nerve block, local dental anesthesia seems to be the cause of MOT here, as potentially in our case. Whether the patient has to be informed about this extremely rare complication remains questionable in view of the large numbers of local dental anesthesia administered daily. On the other hand the consequences represent a severe impairment for the patient. Nevertheless, MOT should be considered in the differential diagnosis in cases of therapy-resistant trismus developing in the weeks after local anesthesia. 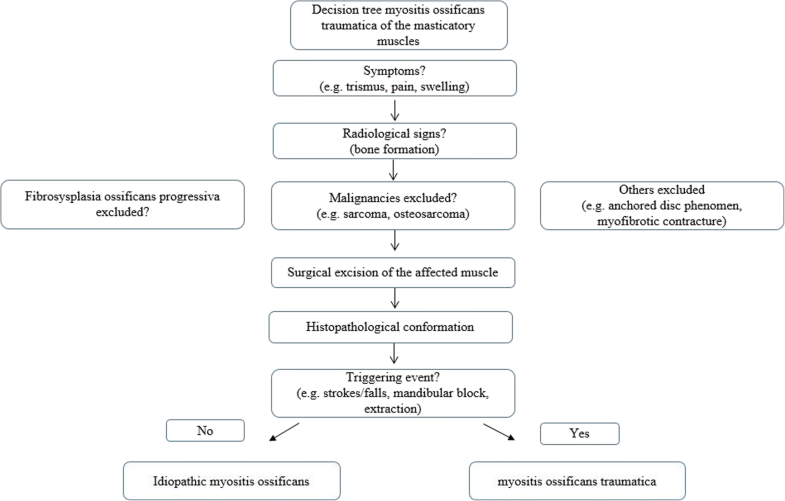 Generally, excision of the affected muscle is recommended as treatment of choice . However, there are different opinions about the time when the excision has to be done and about possible additional measures, such as the use of interpositional materials, treatment with drugs, or physical therapy. Some authors recommended [12, 14, 27] that the excision as well as the use of interpositional material should be performed after complete maturation, about 6 to 12 months after initial symptoms. In contrast, other authors prefered excision at an early stage . There were five relapses, both, in the group of early excision (treatment less than six months after first symptoms), and in the group of excision at a later stage (treatment more than six months after first symptoms). However, the group with intervention at a later time point included 27 cases that was somewhat bigger than the early-intervention group (n = 21). Nonetheless, it is not possible to make any clear recommendation for the ideal time point of surgical intervention based on these data. While some authors suggested aggressive physical therapy after surgical excision , others advised against this procedure . They feared that physical therapy stimulates bone formation with the consequence of exacerbation of MOT. Of the 22 reported cases undergoing excision combined with physical therapy, 3 cases relapsed. In the group of 23 patients who only underwent excision without physical therapy there were also 3 relapses. In consequence, no difference in the rate of recurrence was found depending on physical therapy. In addition to excision, − with or without physical therapy, the use of interpositional materials [12, 16, 17, 20, 28] or pharmaceuticals, such as etidronate or ibuprofen  have been proposed. Often, these additional measures were applied in clinical cases with multiple recurrences [11, 14, 16, 17, 30] so that the benefit of additional treatment cannot be assessed conclusively. The major limitation of this review is the rarity of the evaluated condition, resulting in a lack of research sources which could offer reliable evidence-based information. With this regard, all studies selected for this review were case reports, which hampered a deeper analysis of risk of bias of each study. Nonetheless, the present study aimed to offer a guide decision for the management and diagnosis of MOT. 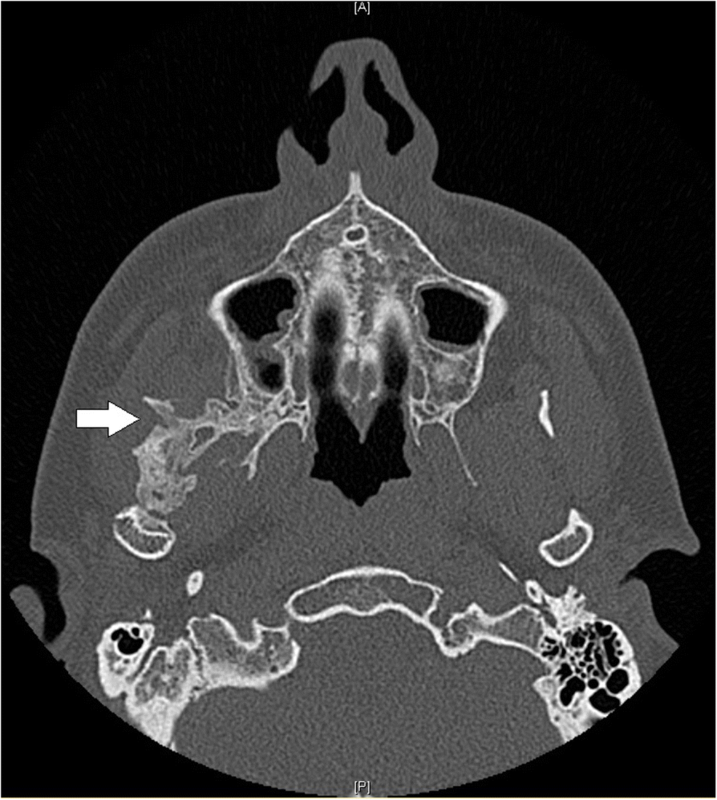 Additionally, the case reported described the authors clinical experience regarding this condition and shows a treatment option for patients with MOT. Dental procedures, such as local anesthesia or extractions, may cause MOT of the masticatory musculature. Women have a higher risk of developing MOT with respect to dental treatment. The most important treatment option for MOT is surgical excision and subsequent physical therapy can have beneficial effects. A benefit of interpositional materials and drugs as therapy of MOT of the masticatory muscles has not yet been proven. MOP has to be excluded. MH, LH reviewed the literature. JK, RW, LB and LFF helped in the interpretation of data. MH analysed the dabase of the clinic. MH, LH, JK, RW, LB and LFF participated in design, and drafting of the manuscript. All authors read and approved the final manuscript. The ethical approval for this study was obtained from the ethical review committee (Ref. no. 2017–052-f-N), Ethikkommission der Ärztekammer Westfalen-Lippe und der Westfälischen Wilhelms-Universität, Münster, Germany.Written informed consent was obtained from the patient. Moola S, Munn Z, Tufanaru C, Aromataris E, Sears K, Sfetcu R, Currie M, Qureshi R, Mattis P, Lisy K, P-F M. Chapter 7: Systematic reviews of etiology and risk: The Joanna Briggs Institute; 2017. https://reviewersmanual.joannabriggs.org.